Don't you ever feel like you need a spiritual makeover? Well, I know that in my own life, the 'yes' to that question has never been more prevalent than it is now. Which is why I have started the Divine Design devotional - 40 Days of Spiritual Makeover. Now, I started it last week but unfortunately I just didn't get around to it every day. Sad, I know...and I have no excuses. I usually like to do my devotions in the morning but I have to get up so early now and get going that many times, I just run out of time. So I decided to do it tonight...Day 3. The whole first week is talking about wardrobe, physical and spiritual. Today's though, was about the spiritual wardrobe and our "essential garments." She uses Isaiah 61:10 to introduce the concept - "I will greatly rejoice in the Lord; my soul shall exult in my God, for He has clothed me with the garments of salvation; He has covered me with the robe of righteousness..."
The garments of salvation and the robe of righteousness, she says, are the essential pieces to our spiritual wardrobe, without which we cannot enter God's kindgom. How many of us have those essential pieces? How many of us wear that beautiful robe of righteousness wherever we go? I can tell you that for me, I have left that essential piece at home too many times. My favorite part of today's "makeover session" as I like to call it was her description of Zechariah 3:1-5. If you haven't read it, stop reading this now and go read it. Seriously, stop. I mean it. Go. Why are you still reading? Go. Read. It. "Then he showed me Kayla, the wife and mother, standing before the Angel of the Lord, and Satan standing at her right hand to oppose her. And the Lord said to Satan, 'The Lord rebuke you, Satan! The Lord who has chosen this woman rebuke you! Is this not a brand plucked from the fire?' Now Kayla was clothed with filthy garments, and was standing before the Angel. Then He answered and spoke to those who stood before Him, saying, 'Take away the filthy garments from her.' And to her He said, 'See, I have removed your iniquity from you, and I will clothe you with rich robes.' And I said, 'Let them put a clean turban on her head.' So they put a clean turban on her head, and they put the clothes on her. And the Angel of the Lord stood by." Although Zechariah was having a vision of Joshua, the high priest of Jerusalem, the same applies to each of us who have been saved by His grace. Satan is right there hurling accusations of all our sins and trying to throw it all back in our faces but Christ paid the price for us already. The Lord has taken our filthy rags from us and has replaced them with extravagant robes of righteousness. We are plucked from the fire and we are His bride...He has dressed us for the wedding feast. I don't know about you, but that just gives me God bumps all over...knowing that the God of the universe has given me the ultimate makeover. What a Christian-ese word huh? But to me it's a crucial part of the Christian life. We must have conviction. And let me just say....I've had my fair share lately. From songs on the radio, corporate worship at Fuel, Fuel-a-day emails from our Pastor, messages on Sunday morning, and quite simply - the quiet thoughts that the Father gives me from day to day, I've been convicted of my own walk and what my walk looks like right now. If one could really track a Christian's walk with actual footprints, mine would probably be zigzagging, disappearing into the grass from time to time, walking in circles, going backwards, etc. I haven't really been on the straight and narrow. Confession: I've found it hard to trust Him with our finances; I haven't been reading the Word like I know I should; I haven't had much of a prayer life; and my actions/thoughts toward certain people have been less than Christ-like for sure. As God continues to prove His faithfulness to me, I am convicted of my lack of faithfulness toward Him. Shame on me. I saw this picture below on FB the other day and it just hit me that I should be that woman. I have been saved for far too long to have any excuses for NOT being this type of woman. Yet, as I look closely at my life, I have a ways to go. Yesterday, I went to Family Christian in search of a devotional that I could use daily...one that might touch on these types of qualities in the spiritual life. And I found one that I am excited to begin tomorrow. 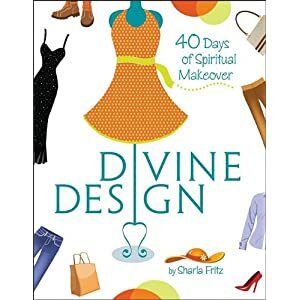 It's called "Divine Design: 40 Days of Spiritual Makeover." It just seems like what I'm looking for right now. And to go along with this whole conviction, our Pastor spoke today about our identity being found first and foremost in Christ and that every decision or action we make has to be filtered through the thought: "I am a child of God first." I HAVE to remember that...when someone does something that irks me - "I am a child of God first." When my circumstances don't look like I want them to - "I am a child of God first." When the gossip reel starts rolling and tries to drag me in - "I am a child of God first." So, I am practicing using that filter and practicing the key words in the photo above: truth, kindness, compassion, charity, love, and prayer - especially in my relationships with certain people.